InteGreat™ A/V table boxes are an elegant solution for extending power, communication and A/V to the meeting presenter's point-of-use. InteGreat™ A/V table boxes provide the depth to mount devices, especially A/V devices, below the table top. It has attractive finishes that can match any room decor. Combine it with other InteGreat™ products for a comprehensive solution to managing and delivering power, communication and A/V connectivity for conference rooms. This field wired version can be easily installed using MC type cable. The wiring compartment contains leads with easy to wire Wago® splicing connectors. Now available with two USB A charging ports. Multiple Connectivity Options – InteGreat™ A/V Table Boxes are supplied with a cable grommet kit that can accommodate up to eight pull out connections. Boxes can also accept up to five Wiremold AVIP, or Extron® MAAP connectors. Each box also has two 15 amp receptacles in the top compartment and one 15 amp receptacle on the underside of the box. 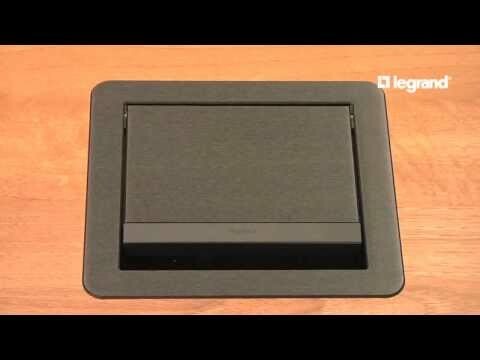 USB Charging - InteGreat™ A/V Tables Boxes come standard with 2 USB-A Charging Ports, 3.1A shared.